“Be different and stand out from the crowd!” We’ve all heard this message. It’s championed in countless movies, television shows and books. 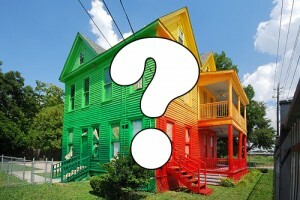 And it is great advice, just maybe not when it comes to painting the exterior of your home. When homeowners decide to repaint, many times they’ll be tempted to put their own stamp on things and choose colors that are far beyond the palette of the surrounding neighborhood. While this seems like a good idea on paper, it can actually hurt the value of your home. Clashing colors on a street can break up the overall harmony of the neighborhood and devalue everyone else’s property as well. So while you don’t have to paint the same beige color as your next door neighbor, do try to choose colors that blend well with the rest of the street. Once you’ve chosen the right colors for the main parts of the house you can let loose a little. The front door is a great way to get back to the old adage “Stand out!” Front doors are easy to repaint and are a good place to differentiate your house from others. So don’t worry too much but do give us a call and let the experts here at Accurate Painting help you choose the right colors so you (and your neighbors) can enjoy your new exterior look for many years!